An irregular podcast about all things Jim Butcher as well as the things Jim's fans find cool. [21m 8s] In the final part of the interview, Fred talks with Jim about what the future holds (and that snazzy Hugo nod). In particular, we find out some details about the upcoming 12th Dresden Files novel, and what Jim might do for a second series after Alera wraps up. Plus, a dangerously decaying orbit around the moon! Tune in. AS YOU MIGHT EXPECT, there are probably some SPOILERS in this one. If you're current on the series, though, you're probably in good shape. [21m 44s] In this second of three parts, Fred continues his conversation with Jim, covering the frequently asked questions of the tour, including things like Harry's relationships (and lack thereof), power escalation, the number of books in the series, the RPG that Fred and others are working on, and that whole "Jim Butcher Himself" thing. Plus, famous people are just people, and James Marsters is a good guy. NOTE: There are some mild series spoilers in here, but it's nothing that people who've read all of the paperbacks and the Turn Coat sample chapters online don't already know. All the same, you've been warned! [19m 58s] In this first of three parts, Fred sits down with Jim at his house to talk about the things going on with his family, his proud papa moment, swinging around nerf lightsabers in the dead of night while camping, exploding zombies with propane tanks, and oh, yeah, that signing tour he's going on in April. Part 5 of a 5-part series: Jim reads the Turn Coat sample chapters at ConDFW. Part 4 of a 5-part series: Jim reads the Turn Coat sample chapters at ConDFW. Part 3 of a 5-part series: Jim reads the Turn Coat sample chapters at ConDFW. Part 2 of a 5-part series: Jim reads the Turn Coat sample chapters at ConDFW. The Butcher Block returns with a bang! Part 1 of a 5-part series: Jim reads the Turn Coat sample chapters at ConDFW. It's the (much-delayed) third episode of Butcher 'Spress! Jim and Shannon's second auction: autographed first-printings of the four books in the Codex Alera! Ends June 27th. 10/21: Blood Lite, "Day Off"
10/31: Backup from Subterranean Press. Subterranean Press is also planning special editions of Fool Moon and Grave Peril, but we don't have any details yet. 1/6/09: Mean Streets, "The Warrior"
[12min 23sec] It's the second episode of Butcher 'Spress! 10/21: Blood Lite, "Harry's Day Off"
Cover art and sample image. Subterranean Press is also planning special editions of "Fool Moon" and "Grave Peril," but we don't have any details yet. 12/02: Princeps' Fury hardcover -- Cover Art! Call in and leave the show voicemail at 301-6377-HAT! Discuss this episode on the forum here. Find a nearby branch of Priscilla's favourite pizza restaurant here! (32m 44s) Fred returns after a long hiatus with an interview. Our guest is Ernst Dabel of the Dabel Brothers, publishers of the upcoming Dresden File comic. (12m 38s) The Butcher Block is back with a new style of episodes: Butcher 'Spress, all the news you mortals need to know! 12/26: My Big Fat Supernatural Honeymoon, "Heorot"
(26min 21sec) Fred and Priscilla talk news, and the listeners phone in their Alera Love. - We hear from Fred, Priscilla, Jackie in Austin, Meg, Charles from Texas, Gloria, and "The Man in the Shadows"... spooky. (14m:23s) Short and bittersweet. Here are the relevant notes. Alera Love Call-In Number! 1-301-6377-HAT (1-301-637-7428) Call in and share the love, dammit! 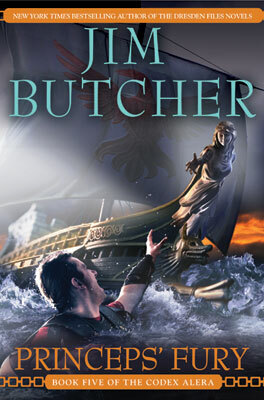 Discuss this episode on the Jim-Butcher.Com Forum. (30m 24s) Fred talks with Ryan Macklin about Finis: A Book of Endings to Give People New Beginnings. Also, updates on various Jim-Butcher.Com news items from Priscellie, and a TV show news update (such as it is) from Mickey Finn. New Blurbs - Captain's Fury and It's My Birthday Too: News Item! Free Button Giveaway: News Item! Preorder Finis at Indie Press Revolution: Preorder it here! (31min 45sec) Fred plugs in for a quick episode in a new format. He checks in with Butcher Block News Correspondant Priscellie for an update on everything that's happened since the last episode, and goes over to the grill with Chad Underkoffler to cook up some "butcher burgers", looking into discrepancies in the continuity of the novels. BB007 - A Storm's A-Comin', Pa! (43min 04sec) Fred (or is that Iago?) talks about visiting with Jim at StellarCon, dishes on the future of the Dresden Files and Codex Alera series, and with White Night about to hit stores, talks about Dresden #10. Plus, information about Jim's signing tour and bookstore appearances, a deeper look at the foundations of the Dresden Files RPG, and a chat with one of our forum regulars about the last four episodes of the TV show. (39min 26sec) Fred talks about the Curse of Knowledge when it comes to the TV show, and brings on a friend who's seen the TV show but never read the books to help apply a "filter". But first, some news about how you can see Jim in March and April, how you can see him on the set of the TV show, and how the TV show's been doing in the downloadable arena. Plus, a small update on the progress of the RPG. (40min 30sec) Fred returns to talk about the first two episodes of the TV show, hints at some upcoming news about White Night, fails to get Jim on the line due to a deadline, and touches on his experience at Dreamation 2007. 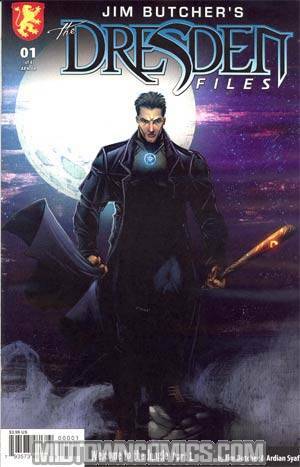 Plus, he sits down with Dresden Files RPG co-author Rob Donoghue to talk about the Dresden Files on TV. Get MP3s of chapters 1, 2, and 13 at the above links! BB003 - Are You Ready For Some Dresden? (16MB, 28m18s) We're less than a week from the broadcast of the Dresden Files TV series. Are you ready? Fred talks about Jim's recent visit to the set, viewing parties, a good reading order for the books of the series, the first five episodes, and some early reviews. Plus, he dishes a little on White Night. BB001 - All About the TV! Fred talks all about the TV show and tackles and defuses the "nerdfury" over changes from the books with the help of the man himself, Jim Butcher. Some other TV show chatter slips in here and there, and the show gets rounded out with a quick plug for some games that Fred has worked on in 2006. Roll tape! Fred talks about Jim, his history, the genesis of the Dresden Files RPG, the upcoming TV show on the Sci Fi channel, and the future of this podcast. All in under six minutes!